A grant for Canadian projects to help Indigenous women in Canada. 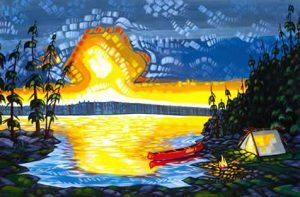 This grant is funded by sales of the limited edition prints of “Awakening,” a painting by Canadian artist David Alexander Risk. We thank him for donating this painting to WICC, and our board for its vision to use this gift to benefit Indigenous women in Canada. GRANT SUBMISSION IS NOW CLOSED UNTIL NOVEMBER 1, 2019. What qualifies you for an Awakening grant? Do any of these areas describe your work with Indigenous women in Canada? Does your project help us promote these values? Is the Awakening grant right for your project? WICC does not give grants to individuals, or for buildings (capital campaigns) or general operating expenses such as salaries and rent. Awakening grants range between CDN$500 and CDN$2000, depending on availability of funds. Your Awakening grant application form must be submitted by March 31 each year. WICC will notify successful applicants by July 10 of the year they applied. WICC requires a follow-up report from you within six months of receipt of the grant detailing how you used the funds. You must use the funds as described in your application. We will be accepting applications for 2019 grants until March 31, 2019.